There are archaeological records demonstrating that hemp is one of the oldest cultural plants and that people knew the hemp as early as 3000 before Christ. Hemp originates in the Middle East and was disseminated around the world later on. The Scythians brought hemp to Europe in the 7th century before Christ, namely to the territory of south Russia. Hemp is an annual dioecious plant used for making fiber and hemp oil which was cultivated in Slovakia mainly for domestic use. It is very hard work to make fiber from hemp. Therefore, hemp growing fell off significantly after the WWII. Hempseed oil was used as an ingredient in food. A complicated technology process was required to make yarn or cloth from hemp fibre. Hemp plants were grown at special fields called konopisko. They were seeded in May, first “male” hemp plants were reaped in July and female plants were reaped in September. Cut hemp plants were bound into sheaves to dry and then soaked in special water tanks to separate wooden part from fiber. Sheaves were then dried again and processed in a hemp-brake. Then the fibre was combed into thinner fibers from which women spun yarn using a distaff and spindle. The yarn was spun manually on the wheel to produce yarns of various thickness and quality. All home-used textiles from the time before the WWII were woven mainly at home. Woven hemp linen/canvas was used to sew various clothes for women, men and children, home textile items (bed sheets, bed linen, ceremonial curtains, beddings for deceased, towels, bread packaging, threads....), sacks, mattresses filled with straw, tablecloths, hemp threads were twisted into thick yarns for repairing shoes or into ropes. Decorations were embroidered or woven into hemp textiles. People had described the hard work of making hemp textile in folk songs of which they later made written records. 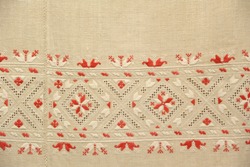 Population of folk clothes among people declined with the improvement of textile industry after the WWII, particularly in the villages around Bratislava. Cotton was introduced as a new material for making clothes made from home-made linen - thus, hemp or flax was combined with cotton in one garment.